Coming to Etsy! 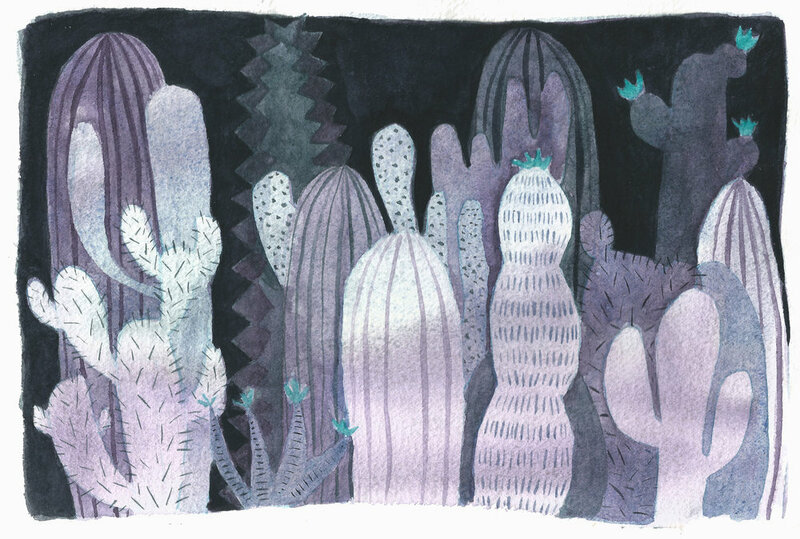 More watercolors! 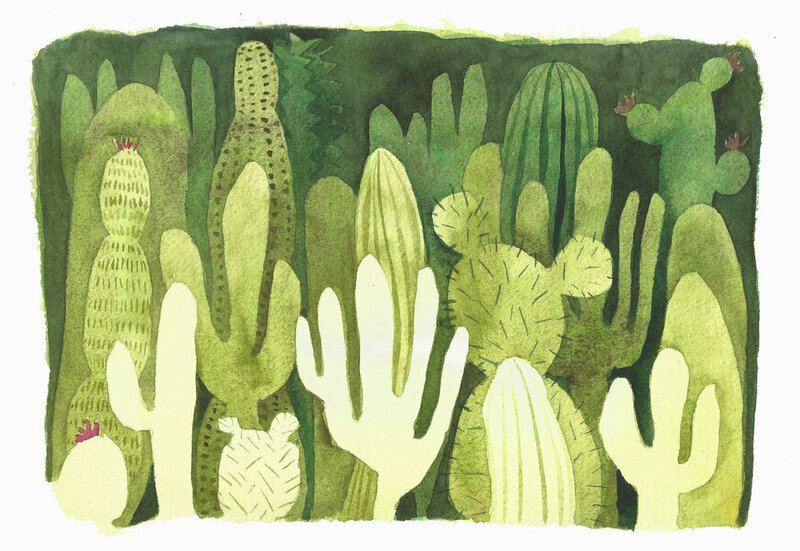 Watercolors are finally finding their way into my Etsy shop. Because I am good enough and there is no reason to keep waiting. I've been painting since March and still feel like I am learning how to handle the medium and my prices reflect that learning stage. On January 5th the movers are coming to pack us up and send our belongings across the ocean. My shop will close on January 4th and won't reopen until I am settled in the UK, probably sometime in February. Locals can find my work for sale at Hatched through Christmas and New Years. Drinking tea while listening to the wind and rain while painting in my cozy studio. Sunshine is great but sometimes I need the excuse to stay in and work indoors. Loving this stormy weather. I was tired and wanted to go to bed as soon as the kids went to bed. I wanted them to go to bed early so I could go to bed early. Then they ended staying up drawing together in their room so I wandered back to my studio to tinker with some paintings. I am glad I kept going. Once I get through my to do list I will start putting watercolors up on my Etsy shop. I am nervous about listing these new creation as I still very much consider myself a student when it comes to watercolor. But I was a student with printmaking too not all that long ago. I fill about a sketchbook a month these days. When I am done they go on a shelf in my studio and I look back on them often. My children look through them and I show them off to friends and other curious people. This number doesn't include the "extra" books I keep around. Why do I do it? Why do I use precious paper and other materials for plenty of less than perfect pages? Because if I don't I grow stagnant and miserable. Because the process is how I grow as an artist and as a person. Because my sketchbooks are important. 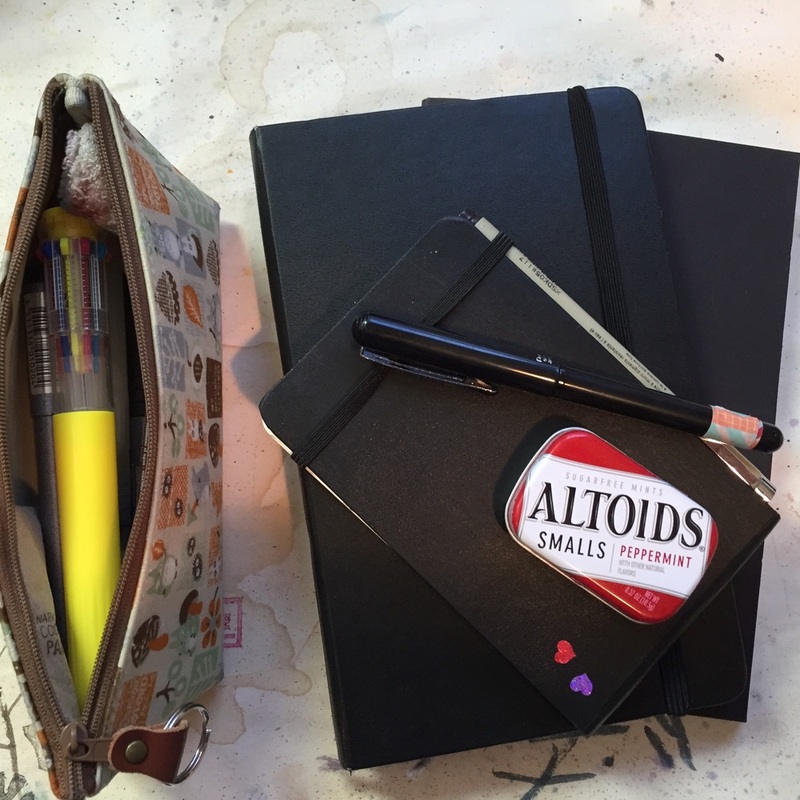 I admire other artists that keep active, consistent yet varied and adventurous sketchbooks. It is a tricky balance for sure to develop and maintain a style while continuing to push yourself as an artist and experiment. As I try to break out of my sketchbooks a bit more and feel comfortable doing pieces for the public rather than for myself I know that making time for my sketchbooks is something that needs to come first in my art life. No matter where I am at in life I will always sketch. The first page of every sketchbook starts something like this. Thank you Liz Steel for helping me get over first page jitters. I took about a dozen watercolors to Open Studios and I sold about half of them. JP Open Studios was a market test for the watercolors to figure out if I should keep at them and how to price them and the answer was yes keep going! JP Open Studios was fabulous fun this weekend as I love connecting with my community. And I love sending original artwork out in the world. Thank you to all those that have supported my fresh start these past months by reading my blog, offering feedback and buying artwork. I will be putting watercolors up on my Etsy shop as soon as I can get new work made, scanned and listed. The fantastic carousel on the Boston Greenway opened last year and is a delight for both children and adults. This little painting went to a very good home this weekend. Perfection. I don't have it. Some artist's seem to attain perfection in every sketchbook page. Andrea Joseph is an example of this type of artist. She hosted the most recent week at Sketchbook Skool and I found putting on her skin and drawing with a ballpoint pen for two days to be too much for me. 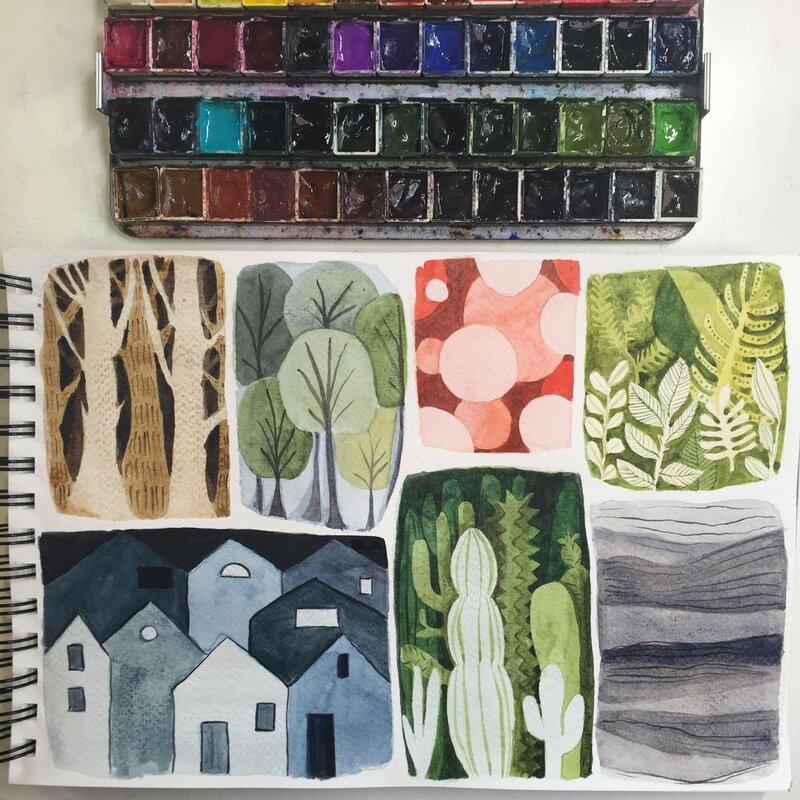 She's a wonderful and super talented artist but her sketchbooks are far too perfectly composed for how I work. For me sketchbooks are to work out problems, record events and try things out. And for that I need freedom to mess up. Good for her for sure but I need to find my own way. But I can still enjoy her beautifully rendered drawings of often humble objects. Ball point pens drawn with ball point pens. I'm sure if I tried this I would end up with a smeared mess on my hands. Enjoying my quiet Art Studio. Good morning and happy Monday. Hope everybody had a great weekend. Mine was pretty phenomenal, the perfect mix of activity, time with family, time alone, time in nature and studio time. Bike ride and sailing on Friday night, ICA with my eldest, followed by Figment Boston and a long walk all over the city, food trucks and friends, then a jog and a rainy Sunday spent in the studio. Doesn't get much better than that. With summer I don't get a lot of uninterrupted time and space to just be in my art studio and experiment. Yesterday was one of those glorious and rare days where I got to spend hours in quiet drawing, painting and experimenting. It all started with a jog to clear my head and get my brain going. I came home filled with new and different ideas and ready to begin executing them. Well, ready after a shower. During that time I set up my little paint pallet with the colors that I use the most and made a little strip of paper with them for reference. I have a fancy set of 48 colors that is gorgeous and wonderful to play around with but I feel I do better with fewer colors most of the time. Now I have 22 colors plus sparkly gold and silver in a handy and portable case. They won't travel with me except on special occasions, I have my Pocket Pallet or Altoid set for daily painting out of the house. But they may come with me on vacation or if I decide to spend a day alone in Arboretum. So much beautiful paint color to play with. Vacation travel was wonderful, but as usual I am finding it difficult to adjust to being back to regular life. Especially the not so regular routine that is summer vacation with my kids 3 and 6 home with me and asking for enrichment all. day. long. Camp is expensive and the 3 year old is still too young for most of them and I feel guilty leaving them to watch TV all day and feeding them frozen pizza. So art we do art projects with together and we go outside to the zoo, playgrounds. playgrounds inside of the zoo, sprinkler parks and more playgrounds. The days are hot, humid and very long. I love them but by 4pm I am so totally done and out of things to do and out of energy for myself. Meditative watercolor paint circles to the rescue. They look cool. They help me relax. They are fun and simple and require more patience than technique and concentration and they help me get to know my paint better. In the end I always feel better and learn something during the process. In my book that is a total win. This one is available on Etsy. It's been a great week here. I printed for three hours on Wednesday and listed one of the prints on Etsy on Thursday. Though I am tempted to keep this beauty because it looks fabulous in our living room. Working on a custom piece for a client that still needs more layers, but this one feels done to me. The schedule of drawing and painting every day and printing once a week is working out super well for me. I hope I can keep it up this summer somehow. If not I can always do it in the fall when the girls are both in school. Original block print next to the carved woodblock used in the layers. I traded for a lot of art and jewelry on Etsy back before my eldest daughter was born in 2007. Full sized work but also a number of small artist trading cards or ATC that I framed together and hung in my studio. It is like a little glimpse of artists hanging out together in a small frame. I love it and I want more! A 2014 collection? I didn't have to go for for my Etsy feature today. My art is changing so much that I feel that I need to share it with my blog audience. For years all I did was print and I saw myself as a printmaker, specifically a woodcut printmaker with the occasional less than successful adventure in monotype or collage. But now I am drawing and painting daily and printing about once every week or two. Most of my drawings and paintings stay in my sketchbook, but the occasional one such as this one comes out on Etsy. Spring was in the air when I painted this abstract piece just last month. Now it is a gloomy rainy day but I am already feeling hints of summer coming. There was a time when my studio was bigger, but highly chaotic and I shared it with a baby that we called bLee. My studio may be smaller now as I gave the bigger room to my girls, but it is just mine and it is organized. I am also happy to not have any baby gear left in my home anymore. No more rocking chair, pack n play, bouncy seat or anything big, bulky and usually ugly. Just endless Legos. A corner for a non-mobile baby. A dresser and a bunch of books is in this area now. My current studio when I first moved it and gave up the pink room. Such great natural lighting! Toddler blee checking out the space before we removed the door and put a gate up. Three happy mLee art fans are now customers as well. Thank you. Three fans stopped by the mLee studio to purchase artwork before their big cross country move next week. All three of them seem pretty happy with what they left with. Good luck on your move and try not to gloat too much about the weather come February. While these beautiful people are lucky enough to live in Boston (for now) and visit my studio in person I realize not everybody is so lucky. So I try to bring a bit of my studio online through the blog and on Instagram. To my customers are all over the world; you too could be featured on my blog. I've loved Rania Hassan's sketchbooks for years but never felt that my sketches deserved such beautiful covers. I feel differently now so I might have to treat myself to one of her sketchbooks this summer. I mostly use wirebound multimedia by Strathmore and flip them to make them left handed friendly, but I do like to keep a small soft bound Moleskin around for ideas and doodles. Moleskin does make high quality watercolor sketchbooks, but they are very expensive for very few pages. The biggest downside of using a wirebound sketchbook is storing them once they are full because the wire binding takes up so much space. I haven't had that problem yet since the sketchbook I had been working on for the past two months was stolen last week. But I am hoping that will not happen again and that I will have many sketchbooks to store. I currently have four sketchbooks going. One graph paper moleskin that stays in my (new) messenger bag with a small clip board, one small multi-media sketchbook to replace the one that was stolen, one small watercolor sketchbook, and one large multi-media sketchbook that I just started yesterday. Not exactly minimalist is it? I will probably drop the watercolor sketchbook once the one I have is full. The thicker paper is nice but not all that useful for me in a small format, plus it is harder to find and has fewer pages than the multi-media version. The artist is a natural hoarder yet a more streamlined home is more efficient for life. That is a blog post for another time. Now it is time to get back to my sketchbook(s)! I love how the tree image works with the craft paper cover. If I got this sketchbook I would probably embellish it with ink drawing. Also known as ATC or ACEOs (art cards editions and originals) when sold. I have been making and collecting these little treasures for years now. I have most of my collection that I traded for back in my Etsy prime framed together and hanging in my studio. It is fun having all those different artists playing together in a single space. Always around to inspire me or just make me happy. Making them myself has also gotten me through many a creative block and helped me try out new ideas in a relatively quick and easy way. When I am printing from a large block I usually find spaces to put a couple of black cards down and voila instant art background. For years I never drew on them and thinking back I must have had some reason for keeping them pure prints but now I can't see a reason why I should stick with that idea of purity. Pen, paint and who know what is next when it comes to these little works of art. No rules. Pick one up on Etsy or maybe if you are in the Boston area and run into me I might just give you one. But not this one. It may be little but I love it. Etsy Finds Tuesday - Block Printed Pillows! Block prints on pillows! I wish I had thought of that. Actually I did and so did others asking me to put my work on fabric including pillows, but I never had the time to figure out how to do it. This artist did and the results are quite beautiful. I have been following the prints of Mariann Johansen-Ellis for years now and am enjoying and totally wanting some of these fun pillows. Well done Mariann! Loving all the buzz and interest in my blog and my new work. As a thank you come celebrate the coming of spring with my studio here in Jamaica Plain. I will be selling many pieces at a special rate, will be serving light refreshments and offering a printmaking demo. May is filling up super fast so Saturday June 7th is the planned date for this event. Sign up for my mailing list to receive an Evite for this event and others. Since all the artwork I did on vacation was in my sketchbook(s) I have lots to share. Head over to my Tumblr blog of drawings if you want to see them all. 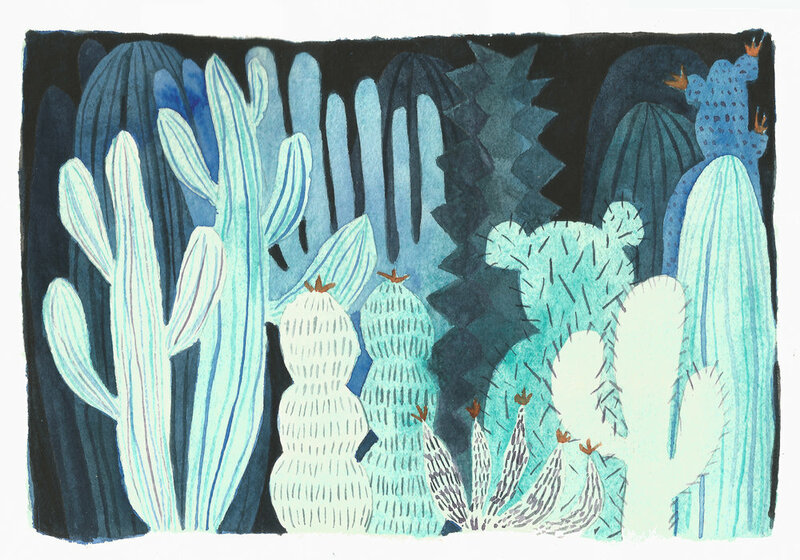 And head over to Etsy is you want this original watercolor mixed media piece for yourself. Potted succulent plant viewed from above.